No. 13 UCF’s nation-leading 16-game winning streak is on the line this Saturday when Pittsburgh comes to Spectrum Stadium for the Knights’ non-conference finale. Despite the Panthers being an ACC opponent, coach Josh Heupel said his team isn’t approaching this game any differently. Pitt (2-2, 1-1 ACC) is off to a disappointing start in 2018. The Panthers dominated Albany in their season opener before getting blown out by then-No. 13 Penn State. To start conference play, they barely got by a struggling Georgia Tech team before losing 38-35 last week to a beatable North Carolina squad. The .500 start followed last year’s season-closing upset over No. 2 Miami. Even with the struggles, UCF (3-0, 1-0 AAC) knows the challenge that its opponent will bring on Saturday. Some talk throughout this week has been centered on Pitt’s size on both the offensive and defensive lines. But in the Panthers’ backfield, there’s another big man that the Knights will put a lot of focus on. Redshirt senior Qadree Ollison, at 6-foot-2, 225 pounds, presents a huge challenge. After allowing 131 yards and three touchdowns last week to FAU’s Devin Singletary, the UCF defense will have a tough runner to rebound against. Ollison is Pitt’s leading rusher this season with 355 yards and four touchdowns, averaging 6.2 yards per carry. His play has helped the Panther offense, especially with quarterback Kenny Pickett off to a slow start. There were high hopes for the sophomore heading into this season, but he has thrown for just 580 yards and four touchdowns to three interceptions in the first four games. While the UCF defense will be looking to rebound from last week’s performance against FAU, its offense will just look to keep things rolling. At 50 points per game, the Knights have the nation’s No. 9 scoring offense. With 587.7 yards per game, they are No. 5 in total offense. Much of that success starts with quarterback McKenzie Milton. The junior has 895 passing yards and nine touchdowns to just three interceptions, and has added 147 rushing yards and three scores on 23 carries. Of course, it’s not all Milton. His offensive line has stepped up and kept him clean in the first three games, allowing just one sack. That has UCF tied with North Carolina, Houston and Army for second-fewest sacks allowed. Only Buffalo has allowed zero. Protecting the quarterback as well as they have is something that UCF’s offensive linemen take pride in. Milton and his receivers have been clicking well, leading to the No. 21 passing offense in the country. 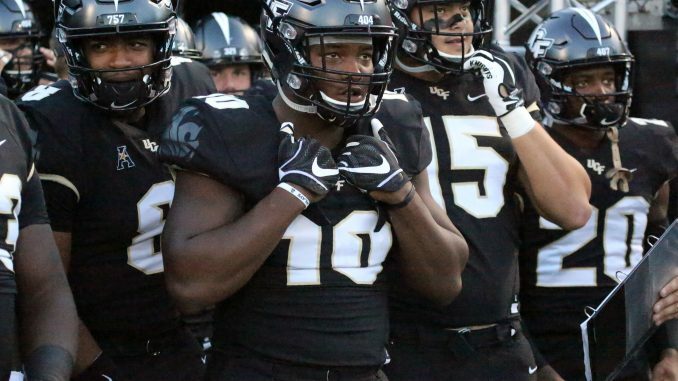 With so much attention on Milton as a passer, the UCF backfield might get overlooked. The Knights have the No. 7 rushing offense with 283.7 yards per game. That has been a team effort, with Adrian Killins, Greg McCrae, Otis Anderson, Taj McGowan and Milton splitting the success. For Saturday’s game, the group will have to be prepared for whichever Pitt defense shows up. In week one, the Panthers allowed seven points. The very next week, Penn State put up 51 points on them. Week three was then a rebound performance, as Georgia Tech put up just 19. The unit then took another dive last week, allowing 38 points to North Carolina. Regardless of the past four games, Pitt has talent and some great size on its defense. The Knights feel ready for whatever gets thrown their way. This is UCF’s final non-conference game, as it starts a run of seven straight conference games on Oct. 6. Kickoff for Saturday’s game is set for 3:30 p.m.